2017 marked the year China's ban on imports of 24 types of solid wastes took effect. News headlines such as "Recycling chaos in US" (NPR) and "Impending crisis for UK waste recycling" (The Independent) have inadvertently revealed the enormous environmental cost for China as the global waste recycling center. Few Europeans and Americans are aware that one of their largest exports to China is solid waste. Every year, millions of tons of unsorted scrap paper, discarded textiles and other items are shipped to China for recycling. As a poor economy short of resources in the 1980s, China accepted the solid waste but over the years paid a heavy price as environmental damage and health problems resulted from the process of recycling them. Meanwhile, some entities in and outside China illegally smuggled sub-standard garbage with no recycling value, adding insult to injury. So as China steps up its fight against industrial pollution and environmental degradation, the decision to give up on solid waste imports is reasonable from a domestic perspective. On the external side, however, it appears that some quarters in the West have taken China for granted as being a dumping ground for solid waste. One example would be thinly-veiled finger-pointing, most recently seen in a December headline of a Daily Telegraph report. It read: "Decades of recycling progress under threat after Chinese ban British rubbish," as if it's China's fault that Great Britain wouldn't be able to take care of its own rubbish. 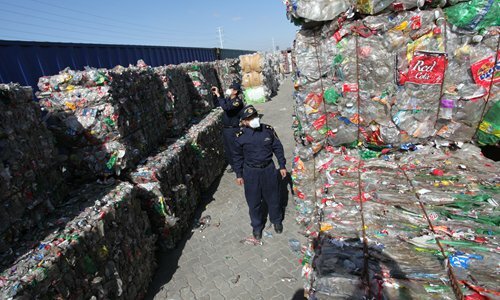 The inconvenient truth is that China's waste-trading partners know such recycling entails legal challenges, intense opposition by constituents as well as huge costs in their countries. Benefiting from previously-permissive Chinese import practices, these industrialized economies over the decades exported pollution and skirted responsibility. So instead of insinuating -- wrongly -- that it's China's decision that leads to stockpiles of waste in the West, more light should be shed on the West's "waste deficit." In other words, the unwillingness and unpreparedness to deal with waste at home, and its collateral damage in China. Relocation of pollution and waste, though rarely talked about, has long been a de facto strategy by developed economies that took advantage of the often lax environmental standards in developing countries. In terms of solid waste in China, it's come to an end in 2017.